Alan - If you ever find "Peet", hopefully "Roebuck" will be near by. @Alan - According to Wikipedia: A Missouri-based soap manufacturer known as Peet Brothers merged with Palmolive to become Palmolive-Peet. In 1928, Palmolive-Peet bought the Colgate Company to create the Colgate-Palmolive-Peet Company. In 1953 "Peet" was dropped from the title, leaving only "Colgate-Palmolive Company", the current name. Notice that it says the Colgate-Palmolive-Peet company. What ever happened to Peet? The doctor picture at the top right cracks me up. We had such blind faith in doctors, never imagining they could be bought for the right price and the quotes were made up! I was a child when the chlorophyll craze was hot. 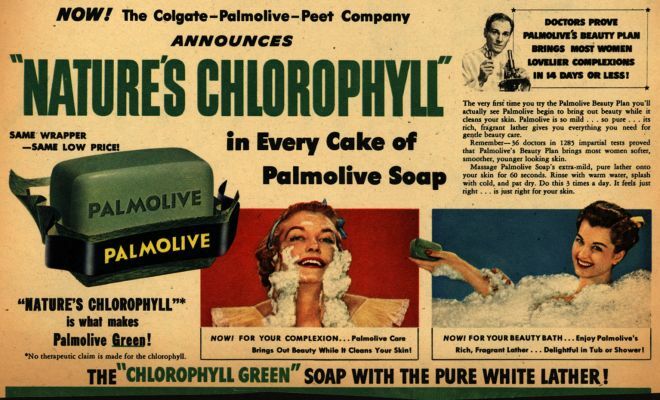 I remember that we had Colgate Chlorophyll toothpaste, but my mother insisted that we never have it again because the green color stained our towels.